For the millions of employees who have stock compensation or holdings of company shares, year-end financial and tax planning may be tricky in 2017 because of the major tax changes that are likely to occur in 2018 under legislation now in Congress. To help, myStockOptions.com provides education and guidance on major issues, decisions, and innovative financial-planning strategies for the end of 2017 and the start of 2018. Year-end is a key time for financial and tax planning among the millions of employees who have stock compensation or holdings of company shares. In 2017, year-end financial and tax planning can be tricky because of the major tax changes that are likely to occur in 2018 under legislation now in Congress. To help, myStockOptions.com provides education and guidance on major issues, decisions, and innovative financial-planning strategies for the end of 2017 and the start of 2018. This content is available in the website's section Financial Planning: Year-End. At year-end, with tax changes likely in the near future, multi-year planning is especially valuable with equity compensation. "You can control the timing of stock sales and option exercises, and you know when restricted stock/RSUs will vest," notes Bruce Brumberg, the Editor-in-Chief of myStockOptions.com. Along with the financial- and tax-planning concepts that apply at the close of every year, in 2017 people with equity comp and company shares must still consider the ongoing impact of the tax changes that took effect under the American Taxpayer Relief Act and the Affordable Care Act. Employees should also consider the major tax changes that are currently in Congress and are likely to be adopted soon, perhaps taking effect in 2018. These may include a simplification of individual income tax rates and the elimination of the AMT, which could result in a tax cut for many people who are now in the top tax bracket but also could result in a tax increase for others. For example, under the bill in the House of Representatives some taxpayers currently in the 33% tax bracket would move into the 35% bracket for compensation income and short-term capital gains. The current (2017) 33% tax bracket for married joint filers goes from $233,350 to $416,700 of taxable income. The income range for the proposed 35% bracket would start at $260,000, so income above that threshold would move you up to the 35% marginal tax rate. Timely year-end guidance is particularly crucial for people who are considering option exercises or stock sales at the end of 2017. "Employees with equity grants and company shares should be aware of the 2017 and 2018 thresholds for higher tax rates on compensation income and capital gains, the additional Medicare tax on compensation income, and the Medicare surtax on investment income," notes Mr. Brumberg. "They may want to consider keeping their income below those known thresholds, if possible. If you are convinced that your tax rates will be lower in 2018 and beyond, you may want to defer income into the future and accelerate deductions into 2017." However, caution is warranted, warns Mr. Brumberg. "Even if you predict that your tax rates are likely to change in the future, many experts maintain that tax rates should never be the only reason for exercising options or selling shares, or waiting to do so, at the end of the year. Instead, make investment objectives and personal financial needs, not tax considerations, the driver of your decisions." Details about tax reform and its impact on stock compensation are available in the related FAQ on myStockOptions.com. At myStockOptions.com, the section Year-End Planning has been fully updated for 2017. Its content includes the following articles and FAQs. For companies, education is vital for ensuring that stock compensation motivates and retains highly valued employees and executives. 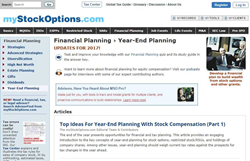 The expert yet reader-friendly content at myStockOptions.com is ideally suited for licensing by companies and stock plan providers for their stock plan participants. A customized version of the website's award-winning content can be seamlessly woven into companies' HR, benefits, and/or compensation portals. Accessible through any internet browser, 24 hours a day, 7 days a week, licensed content from myStockOptions.com lets stock plan participants answer their own questions about their stock grants whenever they need to learn more—saving time for the stock plan staff and costs for the company. For more information, visit http://www.mystockoptions.com or call 617-734-1979.
myStockOptions.com has a related website on nonqualified deferred compensation at http://www.myNQDC.com. The staff also created the successful insider trading prevention video series Think Twice, available at http://www.insidertradingvideos.com. For more information, please contact Bruce Brumberg and Matt Simon at 617-734-1979.